Treat muscle aches, pains, and swelling with this Medique 71301 Medi-First instant hot pack / hot compress. From busy chefs trying to keep up with a busy dinner rush to students racing around on the playground, injuries are bound to happen. This compress will help relieve pain and keep those minor injuries from becoming big problems. Keeping this extra layer of protection on hand is perfect for quickly addressing any mishap in your business. Good stuff, gave it a whirl and within a few minutes there it was, and the box says it only lasts a little while like most, but this was warm on me for at least 3-4 hours, crazy! Another great product from Medique. Very inexpensive and very handy when you need a hot compress pack for accidents and emergency situations. We are excited to have purchased this, but hopefully we wont have to use it! These work great and get quite warm. They won't last you as long as a topical warming chemical will (think salonpas capsaicin patches) but they will work great for more acute things. The inner bag is a little tough to burst - to prevent accidental activation. When I was a firefighter, the EMTs would punch these to activate them. purchased the medi-first instant hot packs. The packs get hot enough, but they are extremely difficult to activate. A lot of pressure is required. When in pain, it is most difficult. Thank you for reviewing this product! If there is a hand or forearm injury that prevents the use of both hands for activation, the vendor suggests finding the inner pouch and applying gentle pressure with the heal of your foot. Extra large for use on large areas of the body like your back. You have to squeeze pretty hard to get it started but then heats up fast! Fast heat for quick relief! Great to have on hand at home or in a first aid kit for injuries. Squeeze package to heat - no microwave needed. Medi-first 6” x 9” instant hot pack/hot compress is an excellent tool for home or travel needs when there’s a muscle strain to your body. I injured my back weight training and use this compress which helped alleviate the muscle pain. I’ll definitely be buying more of these to keep around the house for future needs. I love this Maddie for 6 x 9 instant hot pack it’s a great quality product just need it and you go it’s perfect it works every time. I was amazed by how quickly this compress heats up once it's activated. It's easy to use and provided immediate relief to my swollen knee. The hot compress is a good way to refill a first aid kit. it is well made, and a nice size. The price is excellent, as well. These are good for muscle pain, but also, in an emergency, can be used to help warm some one up. Instant hot pack with the squeeze of a hand here. This is an absolute must have. I do wish this came with more than just one because they are so great! This is a great hot pack to keep in your emergency first aid kit. It gets hot pretty quickly, and the heat lasts for a good amount of time. I have first aid kits every where around my home and in my bag I use when I go biking. This is a really affordable item to add. It lasts a good 4 and a half hours. I will definitely buy more when I need them. The Medique Medi-First five inch by nine inch Instant Hot Pack or Hot Compress has come in very handy on fresh burns or injuries that require immediate attention. The pack really does get almost too hot and stays hot for longer than described on the website in my opinion. I was very impressed. Medique medi-first 6x9" instant hot ack. This hot compress pack is also good to have. When you need to heat it up then use the cold pack to tighten back up after it loosened up as they work together. This is actually a pretty small hot pack, but it works really quickly. I like the products from Medique since you can buy medical products in small amounts practical for average consumers. I like the option of heat for an injury and the Medique 71301 Medi-First 6" x 9" Instant Hot Pack / Hot Compress are great for that! Great hot pack for emergencies, good to have on hand or in a first aid kit, very good price, better than the other store for the same cost! This is a great product! This product consists of a 6"x9" instant hot compress! This is a one time use so discard when done! Just fold and shake then instantly gets hot! this is the most fun part of a first aid kit. if you have an ache or pain when you're away from a heating pad, this is perfect! I've used few instant hot packs, but this one works very well. It doesn't take long to warm up, and it's very, very affordable. I plan on buying a couple more to have for emergencies. Theses are perfect to have on hand for first aid for family and visitor or customers. They turn cold in a about one to two minutes. These are great to put into emergency kits or just to have on hand. They start warming up right after you activate them. I put one in my car emergency kit as well. This is a large size instant hot pack. it makes a great addition to a well stocked first aid station and doesn't require anything special to heat it up. For the low price, these can also be used to keep warm in the winter time. This instant hot pack worked wonders on my neck when I was feeling pain. It helped sooth it fast. The price is great and definitely worth it. 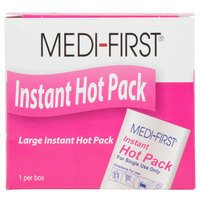 This medique medi-first 6" x 9" instant hot pack is great for compressing your aches. It is activated by squeezing in your hand and will become instantly hot. Luckily, we have not had to use the hot pack just yet, but inspecting the package it came well protected and packaged. Its a one use type of deal, but for the price well just buy more as needed. It gives us that added protection in the event we ever need it! The Medique 71301 Medi-First 6" x 9" Instant Hot Pack / Hot Compress works great by putting on your stomach for menstrual cramps/period. It gives great comfort. Not very expensive and nice to have around. Fast shipment as well. Instant hot pack, can get pretty hot. Similar to cold compress in snapping inside to activate. Nice to have some around in first aid kit. Good product. Hot packs that get very hot, they are wonderful for back aches. One time use packs so get a few. At this price they won't break the budget to keep a few on hand.